A reputation for cross-border debauchery, desperate migrants and drug violence. Can the arts save this troubled city? is a freelance writer living in Southern California. Tijuana is dead, long live Tijuana. After a turbulent decade precipitated by the terrorist attacks of 11 September 2001, hampered by the financial collapse, and the drug war that crippled much of Mexico, the northernmost city of Baja California, just over the Mexican border from San Diego, has emerged from hibernation. Residents are on a mission to harness the chaos of the streets and turn it into something poetic. A national campaign to rein in the power of Mexico’s drug cartels seems to have worked. The Tijuana of popular legend — a playground for young Americans — is fading, and residents are eagerly anticipating how this calmer version of the city is going to play out. Spaces are being reclaimed and re-energised by creative types, who are quietly transforming nooks and crannies dotted about the city into amiable locations for the arts to thrive. The city is returning to one of its strengths, which is local culture. ‘Tijuana has this stereotype of serving the whims of Americans and living by their rules,’ Miguel Buenrostro told me. Buenrostro, a director at the Tijuana-based non-profit organisation Fundación Tabgha, belongs to a network of artists, activists and promoters who are actively rebuilding Tijuana’s tarnished reputation, linking the arts and culture to the city’s economic recovery. For the past year, he’s immersed himself in the burgeoning arts scene, as much for commercial opportunities as for aesthetics. Tijuana’s murder rate has declined sharply since 2010, along with concerns over random street violence. The city’s notorious nightlife district Avenida Revolución (La Revo, as the locals like to call it) is showing signs of recovery. This time, however, the multiplex palaces catering to wild tourists are quiet. Inebriated gringos no longer roam the streets, and clubs catering to outlaws and outliers are passé. Tijuana is no longer just in the business of selling vice. When drug violence crested in 2008, tourism plummeted. Landlords and tenants walked away from their businesses. In La Revo, around 80 per cent of the shops catering to tourists closed their doors. The pasajes, covered alleyways in the heart of the district, were among the hardest hit. ‘The owners, most of whom are in their 80s, have already made their money,’ said Buenrostro, whose family has ties to the district. Their absence proved to be fertile ground for Tijuana artists. They saw an opportunity to inhabit the abandoned arcades, giving rise to a commercial and creative space known collectively as the Pasaje Rodriguez del Arte y Diseño. Since 2010, book shops and galleries that cater to local residents have transformed the vacant corridor into a trendy hot spot for hipsters. 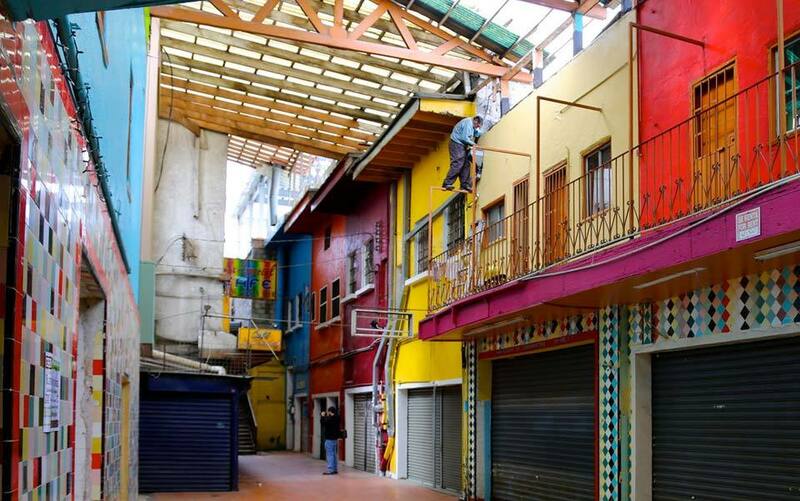 In turn, Buenrostro founded a website and organisation called Reactivando Espacios (Reactivating Spaces) in 2012, dedicated to the recovery of Tijuana’s shopworn arcades in hopes of sparking renewed interest in the commercial redevelopment of the district. This time, it is for the benefit of Tijuana residents, not just tourists. ‘We need to have our own things,’ Buenrostro said. This sentiment is shared on both sides of the border. Many of Tijuana’s residents have blended border identities, are bilingual, and have dual citizenship. And regardless of which side of the border they live on, many shuttle back and forth between Tijuana and San Diego because of close family ties and the lure of higher wages in the US. None of this could have been imagined several years ago. Fear governed the city. Wealthy families moved to San Diego, middle-class families barricaded their doors, and the poor cowered in shacks trying to avoid the drug violence. Then the security forces waged a ruthless campaign to retake Tijuana’s streets from the powerful drug cartels in a struggle that has reportedly claimed 60,000 lives throughout Mexico. (The US State Department still issues travel warnings to US citizens going to Mexico.) Recent statistics indicate that Tijuana’s crime rate is now comparable to major US cities. About the most dangerous thing I was exposed to during my visit involved consuming water from an unknown source. Founded barely 125 years ago, Tijuana continues to unfold in unexpected ways. With no central planning to speak of, much of the city looks improvised. Neighbourhoods mesh in bewildering ways stitched together by a Rube Goldberg-like tangle of roads. The city has been described as postmodern, but gritty, chaotic and dense is more likely how residents and visitors think of it. Art deco ruins, shopping malls and tidy bungalows in residential blocks blend with Spanish-colonial buildings in a mix of finished projects and unrealised dreams. ‘We are all artists in Tijuana,’ the architect and educator René Peralta said half-jokingly, when we discussed the city’s multiple, shifting identities. A son of the city and my guide for the day, Peralta gave me some valuable background. Tijuana’s origins are a quirk of history: in 1848, under the Treaty of Guadalupe Hidalgo, a line was drawn in the sand demarcating the US from Mexico. Only later did that dotted line on the map harden into an iron curtain. Tijuana’s proximity to the US has lured migrants from other parts of Mexico and elsewhere for generations. Settlement kept apace with American desires, first as a drinking and gambling mecca for southern Californians eager to escape polite society, and then as a centre for light manufacturing. Fortune hunters settled in Tijuana during the Prohibition era, lured by the money to be made in booming nightclubs and vice. In the 1990s, a second wave arrived with the passing of the North American Free Trade Agreement to provide cheap labour to maquiladoras, the Mexican factories along the US border. In recent years, Tijuana has become the final destination for migrants on their way north to the US: a triple border fence extending far into the desert deters even the most desperate from attempting the trek through scorching heat and unrelenting desert into the US. So, for now, illegal border crossings have come to a standstill. No longer a way-station to the American dream, Tijuana has become home to countless migrants rebuffed by the daunting challenges placed in front of them. The question remains whether the resurgence in Tijuana’s artistic scene is anything more than a gloss on a city with deep economic and social difficulties. How else to explain Tijuana’s enduring mascot, a donkey painted to resemble a zebra and called the zonkey? The surprise was in a promenade below the park. Drab retaining walls to stop buildings slipping onto the beach had been converted into a giant outdoor canvas. Winding stairs led to a boardwalk bursting with graffiti-inspired art. Mythological beasts, fever dreams and alternative histories of Tijuana jumped from concrete slabs. They formed a loose cast of characters not unlike the exuberant, sometimes-gonzo murals that adorned derelict corners of New York City during the desperate 1970s and uncool ’80s. At the time, New York City was derided as dirty and dangerous. It was also a fantastically productive era for street art. Derelict buildings became proving grounds for a handful of iconic street artists who toiled in the shadows of New York and burst through the grime into pop culture. According to David Reyes, a graphic design student in San Diego, more than 80 public murals have appeared in Tijuana over the past year. Sanctioned by property owners with the help of community organisers, they range in scope from the raw to the transcendent, and offer a glimpse into Tijuana’s potential. Whether sanctioned or not, much of the street art defies easy categories. Mixing wry humour with social commentary and pop-culture references, it refutes the myth of Tijuana as a wasteland assembled from the leftover scraps of the US and Mexico. ‘It’s an easy place to make art, but a tough place to be an artist,’ Reyes told me. What makes Tijuana interesting to the artist? There’s enough social realism to make scores of art-house movies. In a nod to surrealism, the city has an opera house for the elite and maquiladoras for the poor. Tourism and pop culture hybridise and metastasise in unique ways. How else to explain Tijuana’s enduring mascot, a donkey painted to resemble a zebra and called the zonkey? Other cities have undergone unlikely transformations during their history. In the late 1970s, few could have envisioned that New York City was about to undergo a cultural renaissance that reverberates to this day. Visual artists such as Jean-Michel Basquiat, Robert Mapplethorpe and Keith Haring, and any band ready to make some noise, laid claim to the Lower East Side, joining vibrant subcultures that were powerful antidotes to derelict tenements and rundown streets. An enclave of aspiring artists, bohemians and degenerates living on the margins ignited an arts scene so combustible, its influence spread far beyond the confines of the city. Typically, these creative hubs arise in the cosmopolitan cities of prosperous nations — New York, London or Paris are the originals, of course, even if the avant-garde has now moved elsewhere. The cultural boom that transformed lower Manhattan in the 1980s was due in part to the river of cash that flowed through New York from Wall Street. Wealthy tastemakers created a demand for contemporary art that in turn spurred the need for more art to be produced. The process attracted other creative professionals from the publishing and fashion industry, building a buzz that would eventually transform the East Village and Lower East Side into neighbourhoods of boutique stores, restaurants, and gallery spaces. The is the process of urban renewal trumpeted by the urban studies theorist Richard Florida, who argues that artists, designers and writers — the ‘creative class’ — have an essential role to play in the economic vitality of cities. Creativity takes precedence in an era when intellectual capital trumps manufacturing. Tijuana does have the desirable traits associated with creative hubs: affordable rents (at least by US standards) and lively diversions, bolstered by youthful energy. But while the city lacks the network of curators and collectors that made New York’s downtown art scene possible, Tijuana operates on a different frequency that propels it forwards and draws people towards it. A scrum of people given ample opportunities for social interaction makes for dynamic street culture. As the urban theorist Jane Jacobs argued, chaotic streets and random encounters are a driving force in a city’s socio-economic development and ultimate well-being. Is Tijuana ready for its Warhol moment? Perhaps. In 2002 Newsweek and The Guardian declared it a centre for creativity, alongside eight other notable cities. Among them were Austin, Texas, home to a rollicking music scene, and Antwerp, Belgium, renowned for food and contemporary design. Those cities progressed, while Tijuana’s fortunes slipped into the mire of drug violence and instability. After a turbulent decade, which forced Tijuana’s residents to turn their focus inward, the city seems poised to shrug off its recent past and reclaim its playful ways. The frontier food of Baja California has been transformed into a sophisticated bar and restaurant scene. And residents are slowly reinvigorating the arts. Tijuana is coming back, albeit quietly. ‘The first positive coverage about Tijuana, or Baja, was the wine country, then it was the food, and now it’s all about art and art spaces,’ Buenrostro said. With a population of approximately 1.6 million, Tijuana is Mexico’s third largest and fastest growing city. With more people expected to arrive with each passing year, the population is predicted to double by 2030. This is expansion at a breakneck, unsustainable pace. According to the Tijuana Economic Development Corporation, the city needs an additional 54,000 acres of urban land and housing space. There’s a real need for a plan for growth that anticipates the demands of residents. Web designers and writers are hardly the cure-all for Tijuana unless they can build a better infrastructure to alleviate congested roads and deliver basic services such as sewage and sanitation to all residents. As his critics have pointed out, Richard Florida’s ‘creative class’ are no substitute for other, fundamental markers of a city’s prosperity and life. Tijuana is no longer a mere waiting room to the American dream, and the offspring of Mexican migrants are taking the city in new directions, creating alternative narratives for Tijuana in an era of increasing global scrutiny. According to the essay collection Tijuana Dreaming: Life and Art at the Global Border, edited by Josh Kun and Fiamma Montezemolo (2012), the city and its environs serve as a filter and a muse, giving artists permission to remix polyglot influences that riff on Tijuana’s identity as both a latter-day Sodom and a modern global port. For Jaime Ruiz Otis, an established Tijuana-based artist, it seems only natural that his art reflects his experience. ‘I’ve lived along the border all my life,’ he said. Otis is a ‘dumpster-diver’ — that is, he looks for materials in trash bins, which is why his works bear the moniker ‘Ruiz-cycled’. Finding inspiration in trash is his commentary on border life, without being heavy-handed. His projects range in scope from large abstract murals made from discarded inks and paper to lyrical engravings using polyurethane mats. After a brief stint working at a maquiladora in Tecate, some 30 miles west along the border with the US, Otis came to Tijuana to pursue his art full-time. He hasn’t looked back. On the plus side, his spacious loft in downtown Tijuana costs approximately $450 (£290) per month. However, like many fine artists, he still struggles day-to-day. The current dictates of the art market are not in his favour. Among the challenges he faces, art collectors still refuse to venture to Tijuana due to the perceived danger. Fortunately, his reputation means Otis can travel overseas to showcase his work in larger art markets. He grasped the back of his neck as he told me: ‘Sometimes God stops strangling you.’ And like other residents interviewed for this piece, he has managed his expectations of Tijuana. In case the art doesn’t pan out, he is training to become a chef. Tijuana’s recovery is far from complete. But dire predictions about the city’s future have been as accurate as the misread Mayan calendar. After a state-mandated stint in rehab, the city is poised to reclaim itself and continue the ongoing, messy business of urban reinvention.